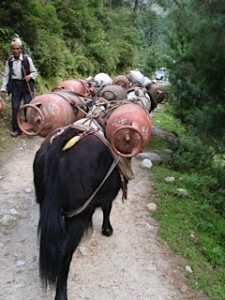 All day we saw many porters carrying up heavy loads of food and drink to re-stock tea-houses and villages along the trekking route. We were covering familiar ground, but heading down rather than up made it all feel quite different. Perhaps one can see more when panting less. As we dropped lower, the forest grew taller and more diverse and the river wider, louder and more powerful. 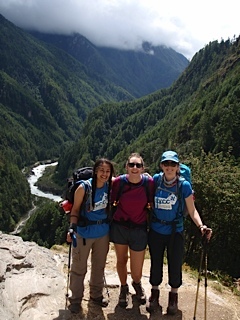 By mid-morning we crossed the Dudh Koshi just before its confluence with Bhote Koshi, tumbling in from mountains to the west of Khunde and Khumjung villages. The new steel Larja suspension bridge spans the river some 30m above its older twin, still in use and festooned with prayer flags for a safe passage. We followed the riverbank past young pines growing through the tumbled boulders, and stopped to admire a honey-bee hive high in a tree. At Jorsale we had a long lunch break. We’d eaten in the same tea-house on the way up, when a photo of the now sadly demised Royal family sparked an intense conversation with Temba about Nepalese history and politics. Today we were delighted to see ghoral (wild goats) picking their sure-footed way up and down the practically sheer hillside opposite – a three-legged male fell and vanished from view for several tense moments before re-emerging below. One couldn’t help but think he’d be an easy picking for a snow leopard. Apparently there are Himalayan black bear in the district, and earlier Kate saw a long low sinuous red animal that we think may have been a marten. Luis and I discussed the apples and crab-apples out the window, while others passed the time before lunch playing cards and snoozing after the long descent. Soon we were back on the track, leaving Sagarmatha National Park and passing through Monjo and Chhumowa either side of another river coming in from the slopes of Thamserku to the east. Around Uche Chholing Monastery, we moved into rhododendron and magnolia forests, sadly not in flower at this time. We passed a hydro-electricity plant producing energy at Chaurikharka, in contrast to the horse trains seen carrying gas bottles up the hill. Back into the land of ripening corn, cabbages, peas and beans. 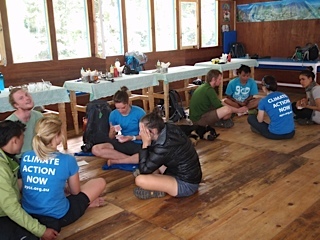 This entry was posted in Activism, Climate change, Environment, Foreign aid and development and tagged activism, AYCC, climate change, environment, Nepal, renewable energy by Philippa Rowland. Bookmark the permalink.